Each year, much like each individual we encounter in life, has a different purpose, a different personality, something different for us to observe, absorb and experience. Since January’s arrival, it has at times felt as though I have stepped into a year which is an ocean of questions ebbing and flowing around me, and I am merely trying to keep my composure, keep my head above water and do all that I can to appreciate the beauty, but not be pulled under. Not all years take on this composition, in fact very few, and none have felt as overwhelming, exhilarating and ripe with potential if only I could learn how to swim amongst the goodness that surrounds me at every turn. As the past five and a half months have passed, I have grappled with the question, am I heading in the right direction for my life, for the life I have been building for myself this past decade? And the answer always arrives quickly and without hesitation: yes. I wouldn’t want to be at any other point at any other destination, surrounded by any other opportunities. How can I be so confident with so much uncertainty? Take a look at my seven reasons below. I titled this post “7 More Signs” because in 2014 I created a list of 10 Signs You’re On the Right Track as I was as well at a point in my life when questions loomed, many questions but as well, an immense amount of hope. And the good news is, if the following 2015 of my life was any indication, all went well, and so too will the future ahead of us all if you too find yourself in any of the scenarios below. Perhaps you’ve felt this at some point in your life, many of the priorities in your life seem to be in flux. Unknowns dance in your mind that will effect your future in more than just a minor way due to entities that our completely outside of your control. The economy – out of your control; the landlord’s decision to raise the rent – out of your control; the weather – out of your control; how others will vote – out of your control; others’ life choices and priorities – out of your control. The lesson to keep in mind if you find yourself in Limbo Land is to assess what you do have control over. Are you handling your finances to the best of your ability, how are your interpersonal skills – building and establishing relationships, are you taking care of your health, are you doing what you can to further your progress, knowledge and skill base, are you the master of your mind, your thoughts and your attitude, are you giving your willpower a chance to work for you? In order to change, to grow, to move forward, we do have to put our lives in the hands of others we do not know or do not know what they will decide. Doing so can be frightening, but if you are in this position, you are giving yourself a chance, and very good chance, so long as you have done your homework, selected wisely and are doing what you can, to put yourself in the best position possible for progress toward your dreams. It happened this past January, I signed my love and myself up for skate skiing lessons. As a classic skier I was feeling quite confident that skate skiing wouldn’t be all that much of a challenge. Wrong. Big time, wrong. Feeling clumsy, even falling down at one point, my frustration was subtle but definitely alive. And what I chose to do was enjoy being a novice, keeping my mind open, listening to someone who knew far more than I and letting go of my pride. It helped, and we had a wonderful, most memorable time. While I am by no means proficient at skate skiing, I was thankful I chose to do something I didn’t know because it not only kept me humble, but reminded me that feeling as though I am a novice is a sign I am choosing to grow. Referring to the analogy at the top of the post, if you feel you are surrounded by a sea of questions, so many that it doesn’t feel there are answers, and if there were you couldn’t find them because of how many questions abound, you are doing something right. Yep, you read that correctly. For me, at such moments in my life, the feeling of being overwhelmed is best navigated when I have a sanctuary to come home to at night and wake up to in the morning, whether that is my cottage in Bend or a particular person who I can completely relax with and just be me. It is a refueling of my energy, my willpower, my confidence and my belief that I can navigate successful through what is now unknown that when I am rebooted can take on the world of unknowns with my full force tomorrow. Similar to #2, when you have many unanswered questions, so long as you are seeking out the answers, it reveals you are choosing to grow, and growth of one’s self, while often unknown as to where you will end up until you get there, puts into your hands more power, more control. Look around you. Who have you chosen to bring into your life? Who do you spend time with when you have a choice? How do you feel when you are around them? How do you interact with them? If the responses to each of these are positive, then you are growing. You are honing your interpersonal skills, you are strengthening what you do have control over and you are aware of the power and influence the quality of people you bring into your life has on your quality of life. While the unknowns may be vast, you find yourself almost giddy as to what you will find once you finally overcome them. Simply put, that is a very good sign. You have chosen a course, of which, its path in front of you is uncertain, but you chose it anyway due to the knowledge of yourself, your passions and your hopes. Strive forward with confidence. I am excited to hear what you find. The more time you have spent in this world, the more you have realized your uniqueness and you most likely have come to recognize that true character, strength and good health reside on the inside far more than what people first notice on the outside. Due to this, you have found there to be no good reason to compare your life to anyone else’s and instead compare where you are today with where you were yesterday, last year, 10 years ago. Keep this habit. Ten years ago had you come up against the challenges you are facing now, you may have cowered in fear. Why? You didn’t have the skills, the knowledge, the life experience to recognize them as the opportunity that they were. Life can seem upside down at times. 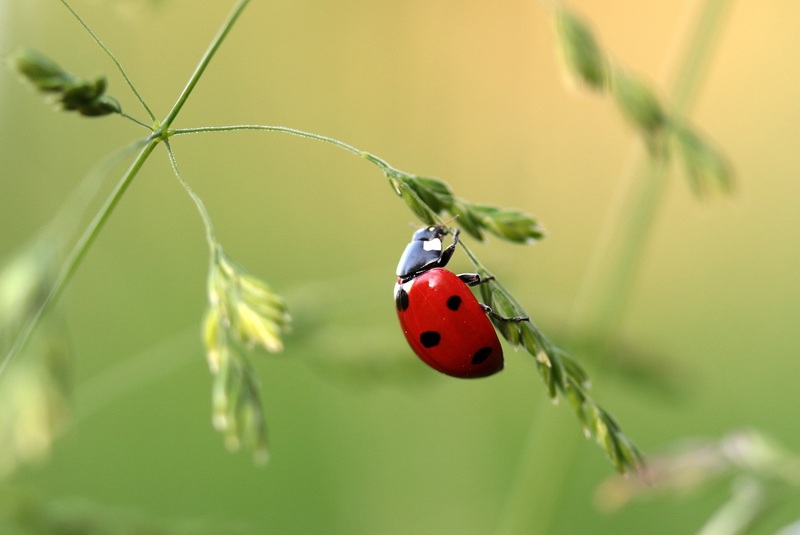 Take the ladybug in the image above for example: The limb on which it is climbing is severely bent due to the weight of the ladybug, and in that moment the ladybug may question if the brand will hold it. But so long as it keeps moving in the right direction, toward the base, the limb will lift, a sense of ease and more certainty will come, but it will just take time and require of each of us to keep striving forward in the right direction. Shannon, this post spoke so much to my current experiences. Many new opportunities are coming my way, all made possible by me deciding to chase my dreams. It is so exciting, but also overwhelming. Who was it that said that the teacher appears when the student is ready? Perfect timing, Shannon.